This year, SGIA Expo is taking place at the Ernest N Morial Convention Center in New Orleans, LA. The Expo combines the best in the imaging industry attendees from sign making and digital imaging to commercial printing and garment decoration. 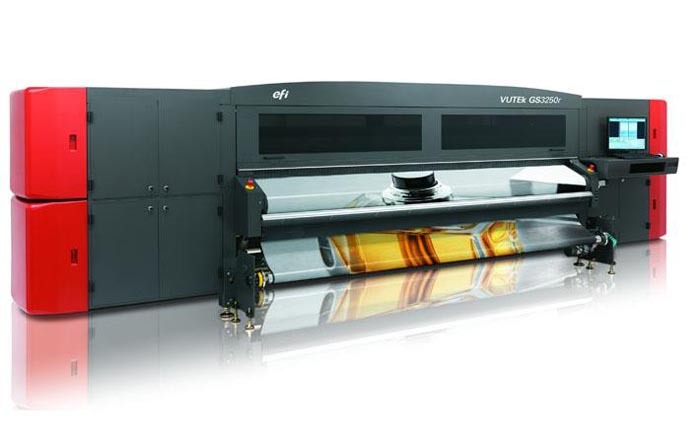 EFI is meeting the demands of different kinds of customers representing a wide range of up-to-date machines which include the new EFI Pro 24f LED flatbed printer, an EFI Reggiani industrial textile digital printer and a complete portfolio of production inkjet printers, EFI Fiery digital front end technologies and workflow software significantly enhancing business productivity. Many of them are shown for the first time. It’s hard to believe how expensive it was recently for commercial printers to produce high-quality output on the offset coated paper! Inside of just printing, one needed to pre-or-post coat ordinary paper or to purchase specialty inkjet coated paper. But now with the introduction of the new Xerox High Fusion Ink the problem will be eliminated. 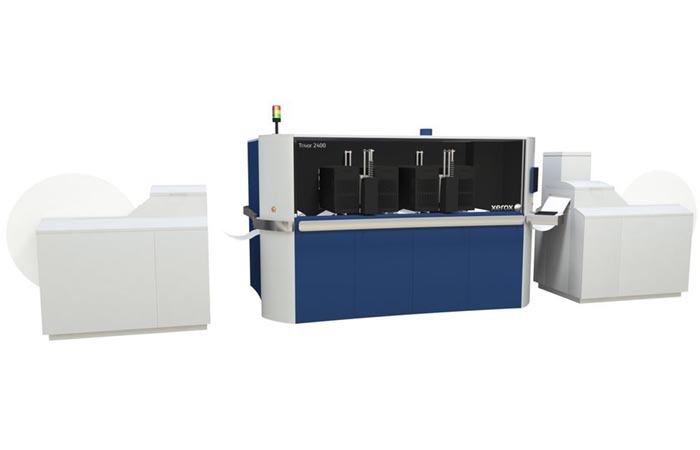 This ink possesses special formula allowing to optimize printing and drying on offset coated media including matte, silk and even glass stock from 60 to 250 gsm (and it also works with a range of uncoated media). The year of 2014 was full of new ideas in both 2D and 3D printing industries. In the 2D printing the main attention has been dragged, from the one hand, to creating new ways of enhancing image quality, and, from the other hand, to unifying mobile printing platforms and making mobile printing capabilities the must-have in every printer and more available for general users. Hewlett-Packard is selling fewer laser printers, and seems to be quite happy with the situation. HP says it’s happy with the installed printer base for the short-term because it means selling fewer low-margin servers. 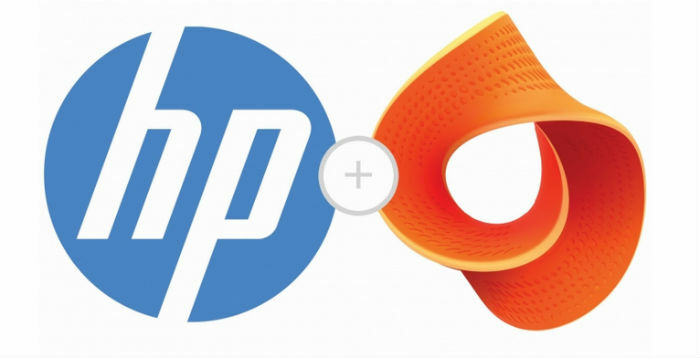 HP’s Imaging and Printing group had revenue of $7.5 billion during the quarter, down 1 percent compared to last year. An 8 percent drop in number of consumer printers sold and a 9 percent drop in sales of commercial sales were offset by a 9 percent rise in sales of supplies. At the same time, unit sales of multifunction printers rose 25 percent during the quarter, while unit sales of wireless printers rose 54 percent, according to HP. Despite the overall drop in servers, HP is increasing its market share, which is making it easier to sell supplies. For instance, increasing sales of wireless printers to home users may result in fewer printers being sold, but not in the amount of pages being printed. The healthy installed base is more important to HP than selling more printers. More than half of HP’s overall profits come from its installed base, a situation which helps insulate the company from dropping printer sales. Last year, Kodak introduced a brand new low-cost ink strategy with the launch of the EasyShare multifunction printer line. Kodak offered cheaper inks for a higher upfront cost of a printer. This strategy seems to have bothered Canon USA, which recently filed a complaint with the NAD of the Council of Better Business Bureaus. There are reasons for Canon to worry, even when Kodak has less than 1% of the market for consumer multifunction printers. First, printer manufacturers hand around the hardware at little or no cost, making major profit on the ink. Second, Kodak’s ink is indeed cheaper. Kodak’s new pricing strategy that breaks the current business model for consumer printers. Also, it is aiming at those who do a lot of printing of photographs at home — a selected group of Canon’s most profitable customers. Mass adoption of EasyShare printers and word of mouth about the advantages of using low-cost ink could turn upside down the today market’s business model. Speaking of the market. Of 61 millions sold printers, Kodak’s share is only 520,000 units. Kodak’s distribution channels are also not so broad. So why would that make a difference to Canon? Because Kodak doesn’t need to get a large overall market share to cause trouble. Approximately, 10% of consumers do 80% of printing, so all it takes is capture a significant portion of that small group to put pressure on the rivals. Perhaps that’s what Canon is worried about. Previously we reported the discovery of yellow dots made by color laser printers and the reaction of European Union Committee on this issue. A study done by Electronic Frontier Foundation finds that most color laser printers add an identifying code on every page you print. This code is actually microscopic yellow dots printed on each page in a grid pattern. Normally these dots are invisible to the naked eye and can only be seen using a blue LED light. 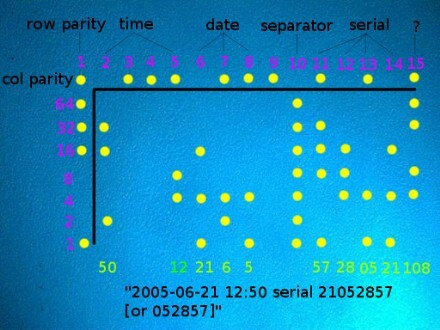 The information in the yellow dots varies, some have just the serial number of the printer and others also have the date printed. On the picture below you can see the date and time when page was printed and the serial number of the printer. Originally the technology was implemented to help secret services track and find counterfeiter who use color laser printers to forge money or securities. But now that color laser printers are becoming more affordable and more user gets them home, these tracking dots are making privacy advocates worry. Buyers Laboratory Inc. (BLI), “the office equipment industry’s leading independent authority and provider of competitive intelligence, testing and reviews on multifunction (MFP), copier, printer and fax products”. BLI semi-annually present its “Pick” award to the products that perform the best in their respective categories throughout BLI’s in-depth lab test. During the test, BLI evaluates all critical performance areas, including reliability, image quality, productivity, print drivers, feedback to workstations, administrative utilities, ease of use, network setup, toner yield, cost of ownership and more. Meanwhile, Oce, a global leader in digital document management and delivery solutions was recently awarded four Spring 2008 “Pick of the Year” awards from BLI, too.